Seasonal cocktails will be in abundance at Paws & Pours: Cocktails of the Farmers Market. Photo: Amanda Lynn Photography. A couple of cocktail events to warm you up this January! On Thursday January 18th, Reza Esmaili is hosting a hands-on tequila and whiskey mixing and tasting class, partnering with Casa Noble Tequila and High West Whiskey, and Tim Zohn (formerly The Alembic, AQ) will be joining him. You’ll enjoy cocktails, bites, and learn some tips and techniques behind the bar. 6:30pm-8:30pm. $59, tickets here. At ~TRACE~ upstairs at W San Francisco, 181 3rd St. at Howard. At the end of the month, on Wednesday January 31st, CUESA and the San Francisco chapter of the United States Bartenders’ Guild are hosting a warm and cuddly winter edition of their seasonal fundraisers, Paws & Pours: Cocktails of the Farmers Market, in partnership with the San Francisco SPCA. You get to enjoy seasonal ruff-freshments (ha-ha!) and vegetarian bites from top bartenders and chefs (including Dirty Habit, Horsefeather, The Front Porch) in the Ferry Building’s Grand Hall. Plus, the SF SPCA will host a doggy petting enclosure, where you’ll have the chance to cuddle with some adorable pups! Yes, fun. Sign-ups to snuggle with a pooch are first come, first served, so don’t delay in arriving. 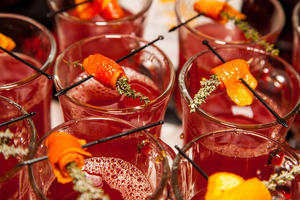 Guests receive three full-size signature cocktails with the featured spirits, along with unlimited sample-size drinks; restaurants serve small bites, and CUESA, the USBG, and SF SPCA will provide some games and prizes. Tickets are $60. Use code “tablehopperpartyanimal” for $5 off. 5:30pm-8pm.